I try to blend in. This summer I have been spending a significant amount of time in Christie Pits Park hula hooping, walking and just enjoying the green scenery. The Pits is just a short 15 minute walk from my house and I like to mix up the route I take there to keep things interesting and fresh. Recently I discovered Peperonata Lane, which is by far the most scenic way to the park. When I first read the name, I couldn’t help but giggle. It is such a fun sounding word like popcorn, or puppy. A quick Google revealed that Peperonata is an Italian dish of slow cooked bell peppers, onions and garlic (yum!). I also discovered that the lane got its name because one of the residents on the street has a yearly tradition of cooking the dish in their garage each year for family, friends and neighbours. Peperonata Lane can be found just South of Christie Pits on the west side of Bickford Park. The Lane offers residents who live on Montrose avenue access to their garages which are located behind their houses. Garages in the back are very common in Toronto, however they are usually hidden in a lane between two rows of houses. These houses back out onto a park leaving their garages exposed to anyone walking by. As a result, these garage doors have become a canvas for spray paint and graffiti. However, these days if you walk down Peperonata Lane, the graffiti is limited to only a few garages. Instead, an outdoor art gallery awaits. 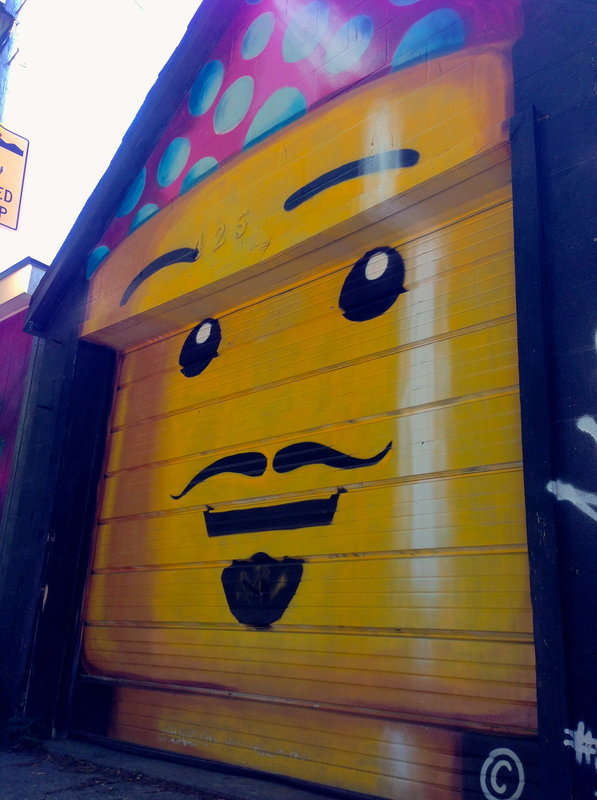 Almost all of the garage doors have been painted with gorgeous, colourful murals. I spoke with one of the local residents who explained that the murals were fairly new, and had been painted to deter people from tagging the doors. The garage with the mural is untouched, while its neighbour is not so lucky. Do you think the original included the beard and moustache? I thought the moustache looked legit, but the beard looked like it had been added on after – one of life’s mysteries. Peperonata Lane has quickly become one of my favourite places to walk in Toronto. I treat it as my neighbourhood’s own tourist attraction, taking my friends there for a visit and so far, everyone has found it interesting. These murals truly brighten up the area and add so much character to the Lane. Just imagine what Toronto would look like if all our garages and blank walls were covered in murals! Some of the murals are done in graffiti style, but they were artistic, in good taste and looked quite nice. A much nicer alternative to the scribbled tagging on some of the other garages. I think this is supposed to be a fish taco. I would highly recommend a walk down Peperonata Lane the next time you are in the Little Italy/Dovercourt/Christie Pits/Bickford Park area. It is free, absolutely beautiful and a great place to snap a few pics. Now my goal is to figure out how to get myself invited to the annual Peperonetta Festival! Anyone out there have a connection to help me out? I really enjoyed seeing those garages on my walk with you…whoever started the trend had a great idea! How lovely and how talented some people are, I look forward to viewing this Lane soon.